Neutral Position ( do not shoot, it's the press...) uses found footage from the Colombian News: in February 2000, a journalist and her crew were caught in the cross fire between the leftist guerrillas and the right wing paramilitaries in the middle of the jungle. While the camera is still rolling you see the journalist doing the sign of the cross on her chest and she immediatelly yells out: "Do not shoot, it's the press..."
The safety of the neutral space, in theory created by the presence of a camera and a microphone, was broken to pieces, and the journalist had to beg for her life, letting the viewers realize she is an active participant of the war that Colombia is experiencing today, just like everybody else in the country. 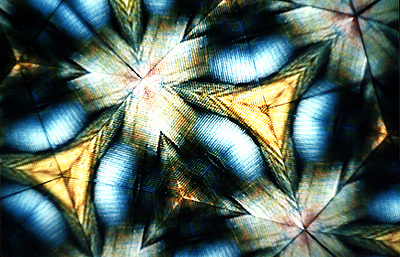 The installation was a kaleidoscope on top of a horizontal tv monitor with a set of headphones. The mirrors in the kaleidoscope multiplied the image of the tv screen, turning it into a beautiful combination of colors and abstract images, but as soon as the user wears the headphones, the sounds of the war - too familiar for us Colombians - breaks the spell of these hypnotic hues. 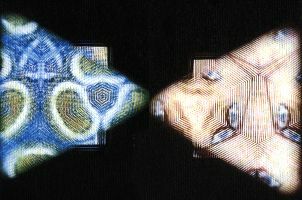 These are some images of the actual installation and the looped video used in it.